The fluid and continuous form of the exterior envelope not only integrates the building with the natural topography but also contains the multiple levels of program, which includes the auditorium, multi-purpose theatre, and auxiliary facilities. The Opera Auditorium is unique in the fact that it can rotate around itself, therefore able to operate as an intimate concert hall or a grand stage “allowing to have audiences all around.” This is an innovative concept is what intrigued me most about this project. It allows flexibility and efficiency within such a contained and sculpted complex. It would be interesting to create such flexible and versatile spaces within a skyscraper, which are seemingly very structured and sculpted. I find your case study interesting in the idea of blurring the edge of interior vs exterior spaces and also allowing for flexible spaces. I agree with your statement that today’s skyscrapers are structured and sculpted in a particular way, not allowing the spaces to be efficient for the program/function being performed within them. I believe exploring ways to create flexible spaces within a high rise could be beneficial to the activity taking place within. I love how this building seems to almost be part of the landscape it is in. The outside seems so natural, while the inside seems almost supernatural. The interior inspires a sense of awe, which would hopefully be associated with the experience of the opera. Although very inspiring as a form, I am curious about the acoustical implications of this design. Are the parametric forms of the auditorium interior engineered to maximize sound quality/distribution? Is there technology that can model surface reactions to sound in a 3d model? 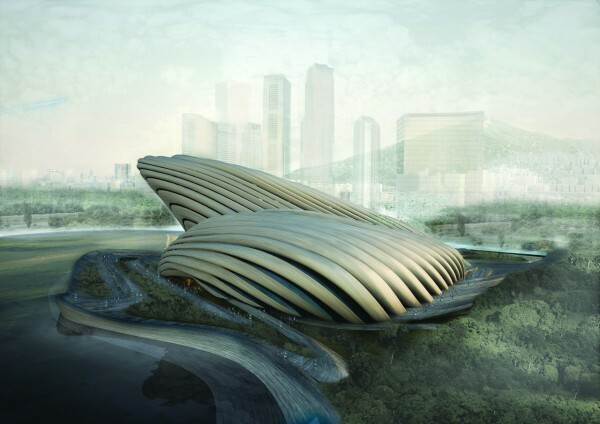 This form reminds me of a modernistic version of the Sidney opera house, with the curves, the building seemingly leaning over the water and the city in the background. yoo!!! The organic shape looks alike a shell or clam. The most attractive or creative part of the design, I think, will be the interior because the quality of light created from the patterns, is alike that you are traveling or taking an adventure inside a flower. When I first look at the exterior of this shell, I was very interested in the interior. No matter how attractive the exterior is, the interior would sometimes be a very uninteresting piece. However, when I look at the interior image of this opera house, I was fascinated by the curves inside, which bring a flow to the space so that it easily draw people into the deeper part of the building. 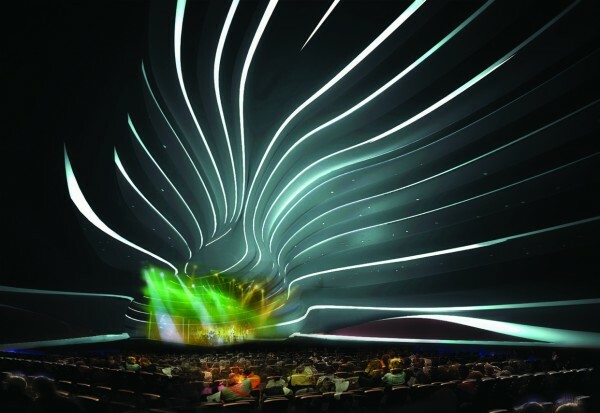 Moreover, the main auditorium is fully engaged with the flow of the curves. I believe it would add a quite different experience to the audience.